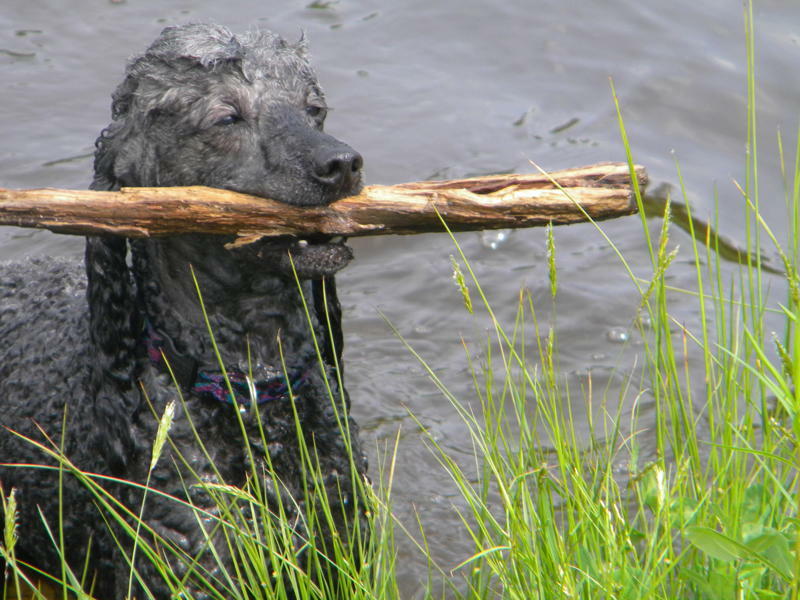 Pond Swimming and Bad Hair Days? 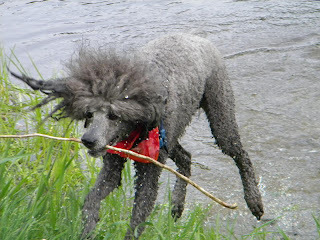 My friend Rick Miles attends all the Poodle parties with his friends up on Poodle Mountain in New Hampshire. 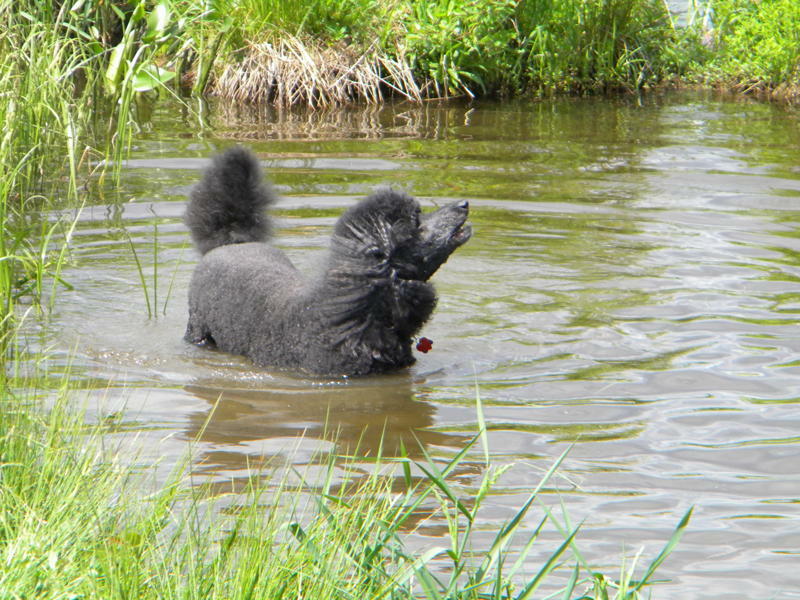 I love seeing all the Crabapple Downs Poodles and their owners having fun...but my favorite of all the photos almost always involve Poodles in the Pond on Poodle Mountain! Enjoy! Thank you Rick, for sharing the joy of Poodle Mountain even with those of us who have never had the pleasure of visiting! Who is the Poodle Blogger? Hi! I'm Melanie Schlaginhaufen, the Poodle blogger. As of this date, the Poodle blog is still in its beginning stages. However, I would love for you to join us, and let me know what type of things you would like to read about on a Poodle blog. 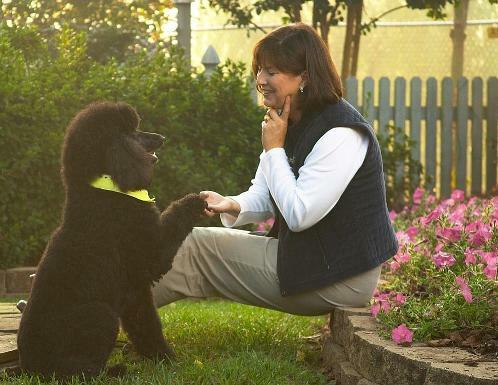 I am a dog trainer and writer, who specializes in solving canine behavioral problems. 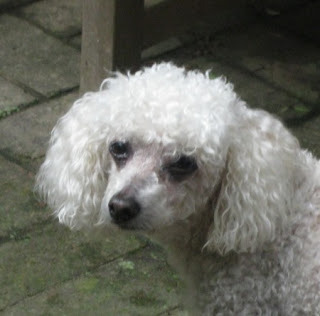 My bio can be found on my Knowing Dogs website, by clicking here: About Melanie. 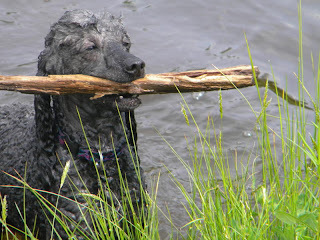 Also on my Knowing Dogs site, you will find dog training articles, as well as information on affordable, easy-to-read dog ebooks that you may find helpful. On my Knowing Dogs website, you will also find a link to the Knowing Dogs blog, which is full of dog training articles, product reviews and all types of things for dog owners and dog rescue volunteers. Hope to meet you soon, via one blog or another! 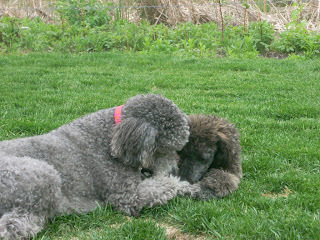 My friend Jeanne Haight never fails to make me smile with photos of her lovely silver Poodle girl "Morgen" interacting with her newest addition, "Cole". What often makes the photos so cute are the captions that Jeanne includes. I thought this one was especially cute! Whatcha got there, Sis.........more rabbit poop???? Thank you Jeanne, for sharing their fun with us! 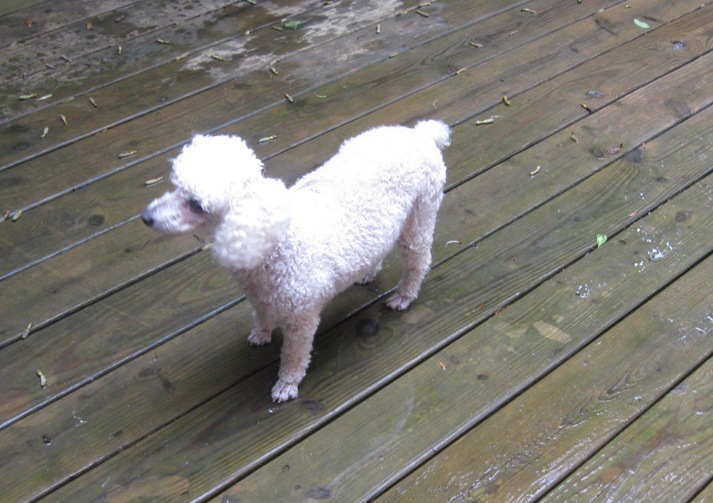 My friend Corinne Grant, in Greensboro, North Carolina asked me to let all of my Poodle friends know about this special little girl named Lacy. She is in need of a forever home due to the death of her owner. Lacy is a 10 year old white miniature poodle. Her owner died 3 weeks ago and she has been at the vet having a little surgery to remove two warts on her back so she is missing a little hair. She gets along great with kids, other dogs and loves to be talked to. Her owner was an 89-year old widow and she is a inside lap dog. I have all of her records. She has been a patient of Greensboro Vet on High Point Rd. She has had her senior annual and is on heartworm preventive. We have all of her supplies. She has a small heart murmur and she is on meds for that. If you do have someone interested we would love to talk to them We are willing to supply them with a supply of heartworm and heart murmur meds if need be. Thanks for your help. She is a really sweet dog. Is there a place in your home and your heart for this little one? Lacy is in the Greensboro, North Carolina area. If you are interested in Lacy, please contact Corinne Grant at cjgrant114@bellsouth.net. Jeannette Clemons sent me these wonderful photos of her parti-colored girl "Dora", a/k/a Pandora P. Pantaloon. Just her name alone indicates her adorable character, don't you think? Miss Pantaloon was very surprised this year when Jeannette's automatic sprinkler system kicked in, but as you can see from the photos, she quickly decides it is great fun! SIT means TAKE A SEAT! SIT means TAKE A SEAT!! "Taking a seat" is something quite different than just "sitting". If you invited a visitor into your home, and you told him to "take a seat" as you pointed to your couch, you would expect that he would sit down and stay politely seated while you engaged in conversation. You might offer him a piece of candy from the dish on your coffee table, and your guest would say thank you as he took the candy, while still remaining seated. However, if a visitor to your home was asked to take a seat and he simply sat quickly on the couch, grabbed a candy from the dish, popped up and then started to wander off, instead of staying seated and engaging in conversation with you, you would think he was pretty rude, right? Yet we tolerate this behavior from our dogs all the time. Just a quick sit and pop-up for a treat is not an acceptable behavior for a dog when we ask them to sit. Is the dog being taught a "sit" or is he being taught a "sit, treat, pop-up"? From this point forward, when you tell your dog to "sit" think of it as asking him to "take a seat". Taking a seat (remaining in the sit position) is essentially the same as a sit-stay, but it is not necessary to add the verbal word "stay" if you teach the dog that sit means sit until I give permission for you to get up. If you do wish to use a verbal command in addition to saying "sit", consider using the word “wait” for the sit-stay, reserving the word “stay” to mean remaining in a down-stay position. This way your dog does not get confused by the use of “stay” for both sit and down. Dogs often lay down on the sit-stay or sit up on the down-stay, because the same hand signal and same word is being used for both exercises. Better to simply say "wait" or repeat "sit" if you feel the need to say something to remind your dog that he should remain seated. Houdini is having a good week! 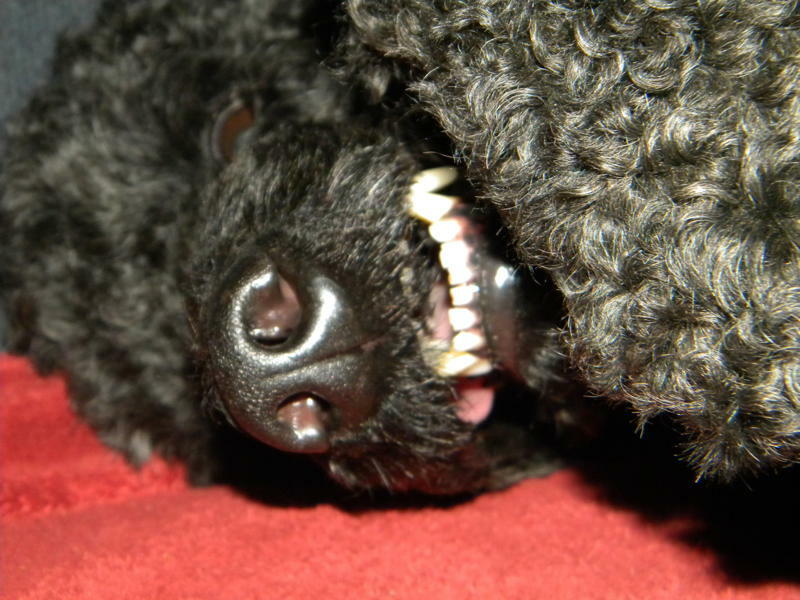 Many thanks to my friend Rick Miles for this fun photo of his Standard Poodle "Houdini". Maybe he was feeling as happy as the rest of us this week due to the big news we are seeing on TV? I don't know Houdini's politics but I know he is a guy who loves life and certainly loves to pose for the camera! Houdini is such a character, and I never get tired of his funny faces! Thanks again Rick, I so enjoyed this photo. Gorgeous Poodle Martingale Collars from Poodle It! Don't Miss Absolutely Unique and Fabulous Products on Poodle It!